Walter Keeler has been a friend of Wobage for as long as it’s been a pottery and we most look forward to him joining the Wobage crew this Summer. Wally continues to wow audiences all over the world, last year on a tour of North America, with his deft and thought-provoking demonstrations and lectures, always full of wonderful anecdotes. Unquestionably one of the very finest, most innovative and deeply respected potters in the UK, Wally’s intelligent, often precise and geometric jug shapes, vary from simple handleless creamers, to ever more extravagant and sculptural explorations. For the 2014 programme, we’re delighted to welcome Wally for two days of demonstration and tutorial during the ‘Jug-Making’ course. 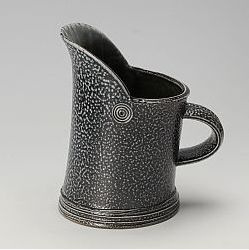 Wally trained at Harrow College of art on the now legendary Studio Pottery course, under Victor Margrie and Mick Casson. 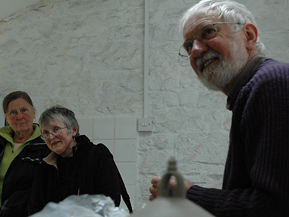 He later returned there to teach, setting up his first studio in Bucks’ in 1965, and later moving to his current home and studio in Monmouthshire in 1976. Not satisfied to be confined by a single medium, Wally continues to explore much more outside of the high-fired salt-glazed stoneware which first earned him national and then international acclaim. In addition, he now works in earthenware, exploring creamware, Wheidon-ware and lemon yellow glazes.